EASY listening doesn’t come any easier than with the good old Osmonds, the indestructible Seventies heart-throbs who seem to be defying age and illness to keep those albums coming. 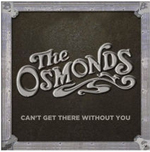 those famous Osmond harmonies which seem to be almost entirely unspoilt by the passage of time. It may not break new ground but won’t disappoint loyal fans.